The latest indicators confirm continuing recovery for the long-beleaguered restaurant industry. Notably, the U.S. Census Bureau’s retail sales estimates for February show restaurant sales hitting a new record high for the tenth consecutive month, the National Restaurant Association pointed out. The “food services and drinking places” category recorded total sales of $43.4 billion for the month (adjusted for seasonal factors and trading days). That was up less than 1% versus January 2012, but up 8.2% versus adjusted February 2011 sales for the industry. Furthermore, for the 12 months through January 2012, sales at full-service restaurants were 8.7% higher than in the previous 12 months –- the fastest growth pace since the late 1990s, when the economy was booming, reported The New York Times. The sales gains at full-service restaurants -– which range from moderately priced fast-casual chains to top-end establishments -– also considerably outpaced those of limited-service restaurants or QSRs, which fared the worst of the recession far better than their sit-down counterparts, as consumers elected to trade down for their less-numerous eating-out occasions. The data show Americans now spending about $220 billion per year in full-service restaurants, $211 billion in limited-service restaurants, and $21 billion in bars. While Americans are coping with significantly higher gas prices (those jumped 6% in February), grocery prices were flat for the first time since July 2010, and wholesale food prices edged down 0.3% (following declines of 0.5% and 0.7% in December 2011 and January 2012). Perhaps in part reflecting less inflationary pressure on restaurants’ costs, menu prices posted their smallest monthly gain in more than a year in February (+0.1%), down from 0.4% in January. While restaurant operators of course seek to improve their margins by raising prices and/or check size wherever feasible, stable or moderately higher restaurant costs may also be encouraging the trend to dine out more frequently. In addition, the National Restaurant Association’s industry tracking data continue to show optimistic trends. In January, its overall industry health index, the Restaurant Performance Index (RPI) stood at 101.3. While that was down from December’s strong level of 102.2, January marked the third consecutive month that the RPI stood above 100, which signifies expansion based on various key industry indicators. “Restaurant operators reported positive same-store sales for the eighth consecutive month, and a majority of them expect business to continue to improve in the months ahead,” reported Hudson Riehle, SVP of the association’s Research and Knowledge Group. Mintel, too, recently reported positive indicators based on its consumer tracking. Fully 65% of respondents who had visited a restaurant in the past month indicated that they will spend the same amount at restaurants in 2012, and 12% plan to spend more this year. Among that 12%, 59% said they will spend more in casual restaurants, and 57% said they will spend more in family restaurants. Of course, along with the economy, the restaurant industry is not out of the woods just yet. As Packaged Facts noted, U.S. households with incomes of $100,000 or more account for more than a third of restaurant spending, although they comprise just 17% of total households. And while the numbers of higher-income and lower-income households has grown since 2007, the number of middle-income households has declined. “Because restaurant spending correlates to household income, the crimping of the middle class is a major hurdle for the industry, as it is of course for the national economy overall,” noted Packaged Facts’ analysts, in its “Foodservice Landscape in the U.S.” report. Also, while total sales for U.S. full-service restaurants grew considerably last year, many went out of business. The number of these restaurants declined by 12,000 operators, or 3.8%, according to CHD Expert, a foodservice research provider. Limited-service restaurants saw fewer closures: down by 4,000, or 1.3%. However, fast-casual chains offering “fresh, diverse” menus continued to thrive. In addition, “American traditional” and “American regional” menu types increased by more than 7.5%, and Asian restaurants, and bars and grills increased by more than 2%, CHD reports. 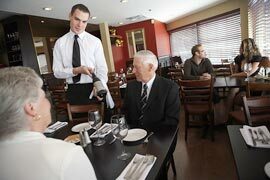 1 comment about "Restaurant Industry Shows More Signs Of Recovery". David Teichner from Yowza! !, March 21, 2012 at 7:40 p.m.
Great news, and we've an increased activity of consumers using restaurant coupons on our app...Yowza! !